The health benefits of flaxseed oil are numerous. Flaxseed oil, also known as linseed oil, plays a role in healthy skin care as well. In terms of the health benefits of flaxseed oil, various research and studies have indicated that they are numerous. 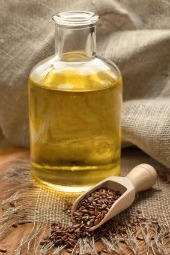 Consumption of flaxseed oil may result in lower incidences of cancer, in particular colon cancer and breast cancer, lowering of blood cholesterol and therefore the reduction of strokes and heart attacks, protection against the development of high blood pressure, quicker recovery time for tired muscles, and the accelerated healing of sprains. Other benefits of flaxseeds and flaxseed oil include improvement of eyesight, improvement of liver function, help with arthritis, and it can alleviate some allergies. Basically, all body systems can benefit from flaxseed oil consumption. The skin benefits of flaxseed oil are thought to be widespread as well and therefore it is a great food for healthy skin. Flaxseed oil benefits in skin care include: anti-inflammation properties, reduction in skin irritations and redness and quicker healing of skin bruises and skin wounds. This oil may also help prevent or slow the development of skin cancer, plays a role in the maintenance of younger looking skin, and it may play a role in treating and reducing skin problems such as psoriasis, eczema, rosacea, acne, and dandruff. Flaxseed oil also strengthens fingernails and toenails as additional benefits. The skin benefits of flaxseed oil are not limited to ingestion. In fact, applying it directly to skin helps individuals with dry skin problems and locks in moisture. It makes skin smooth, radiant, and helps reduce skin wrinkles and other signs of aging. Although many of the health benefits of flaxseed oil and skin benefits of flaxseeds are still to be rigorously examined, there are plenty of initial indications of numerous skin and health benefits for flaxseed oil and therefore, should be considered as part of a healthy skin care routine.